It is the programmers that builds software, not the tools. Are glossy so-called productivity boosters beneficial or leading to sub-optimal code? The other day I was reading the book "Object thinking", while I have my reservations about some of its content I found the following quote striking. tools, methods, and processes instead of better people? This is by no means new knowledge, already in 1968 people were making noise about it: Sackman, Erikson, and Grant "Exploratory Experimental Studies Comparing Online and Offline Programming Performances. ", Communications of the ACM 1968. Ever so often, at conferences, at product release parties, and so forth, tools are promoted as breakthroughs in our ability to create software. The mantra always being "productivity". And every new feature seems to be addressing just that. I couldn't help but reflect upon some of the features in my IDE that over the passed years have surfaced, and which seem cool. But are these features simply masquerading bad code? As counter intuitively as it may sound, perhaps all those glossy features and eye candy may be leading us in the wrong direction. Towards worse code, with worse readability. Don't get me wrong, I'm not here to preach the use of Notepad or - god forbid - Edlin. I love and enjoy my development environment, but hear me out. I've assembled a list of features we may or may not really want in our IDE's. I have no delusions as to whether this trend can be stopped adding nice looking features. My mission is simply for you to gulp the list, reflect for a moment, maybe your favourite features of the editor are in fact making the code worse in the long run. Take the automatic semantic folding features found in most editors and IDE's today. The only time I've ever really appreciated that feature is when I had to make changes to certain configuration files. Now these configuration files are not for kids! The nicer ones were about 1000 lines (and growing), while the more mature were around 6000 lines. Now that is a whole lot of configuration! I guess the XML format did not help compress the size either. Here, being able to fold everything up and expand only the sections of interest was a great deal! And of course you'd meet the average Joe-blow who did not know that the IDE could fold all levels in one key-stroke, and bewildered himself with trying to search and match indentions. While you always feel good about yourself helping a colleague out, showing him a great productivity boost such as "fold all levels", allow me to speculate for a moment. Perhaps, just perhaps, we were better of had each of the major parts of the configuration file been separated into distinct files. Most of the time, those expander-buttons in the side of the screen is a distraction more than anything. Why do we dislike regions? Because they hide code, and force the developer to perceive the code from a particular angle. 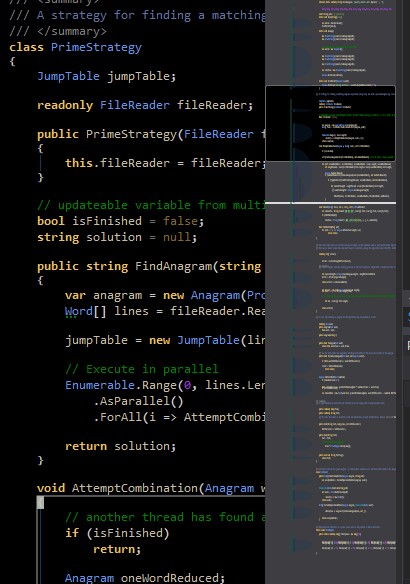 The screen shot taken from codinghorror.com is particularly good at showing what looks like "a well-organized code file". In fact it's not. The regions doesn't clearly convey what to expand, when I'm looking for a particular method or property. We all have seen the effects of overused regions in the code bases we maintain. Particularly painful is when new code is littered with these beasts. The automatic use of regions in every code file is a code smell and must be avoided. There are circumstances where regions have its merits. Particularly when working with very big files. A first step towards splitting up such files is to annotate them with regions. It can change your life from miserable to just bearable. It enables you to compress the file to a screen-full from which you may expand the appropriate region. But often times, since we have the code folding we are not allowed the time to enable multiple configuration files, that are merged in memory when the application starts. Another occasional usage that is when grouping the methods and properties implementing a specific interface. Especially when the class implements many interfaces. In these situations, however, one can also consider using C#'s "explicit interface implementation feature" - be wary, as it requires a different way of accessing your objects. Rather than using regions in your code, you should break larger classes into smaller classes and break larger methods into smaller methods. As with comments, if you feel the need to introduce it, re-think if you can express the same with code the compiler doesn't ignore. The code scrollbar is according to Microsoft "When you are working with long code files, it can be hard to keep everything in mind. You can customize the scroll bar of the code window to give you a bird's eye view of what's happening in your code." This is all backwards. Why are the files so long, that you have no overview without this feature? And frankly, how often have you really saved any time using this feature? I have a nagging feeling this feature is all about looking smart and needlessly burning CPU cycles. How many of you have dealt with functions thousands of lines long..
and you find your way around it by the number of indents..
oh yeah, now we're at the third indent down..
its the third-if-statement.. now we are navigating the code geographically ..by landmarks. We should navigate the code by name instead of geography. Those landmarks should be method calls. 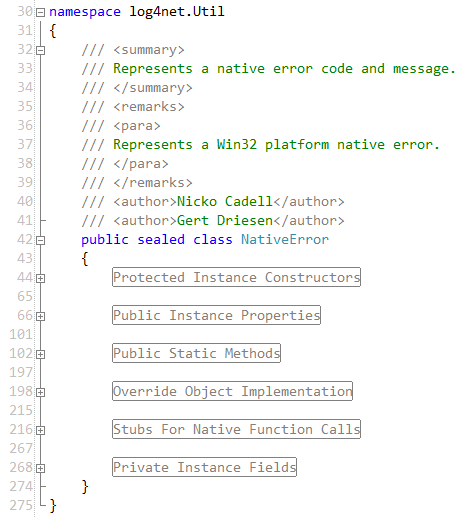 The popular Productivity Power Tools for visual studio offer a feature where by each column matching the indentation size is highlighted with a vertical line. This enables the developer to better see the span of a scope. And it looks cool, just look below. There are fewer problems with many scopes as long as the method is fully visible on the screen. But when code grows, scopes, especially scopes for conditions and loops are heart of code complexity. On a similar vein as "vertical indentation guides", ReSharper has a feature called scope outlining, where you get to see the outlining of the current scope. Compared to "vertical indentation guides", the code is less cluttered with all the vertical lines, only showing you the scope from the position of the cursor. If you are used to coding on a white background this looks insane. 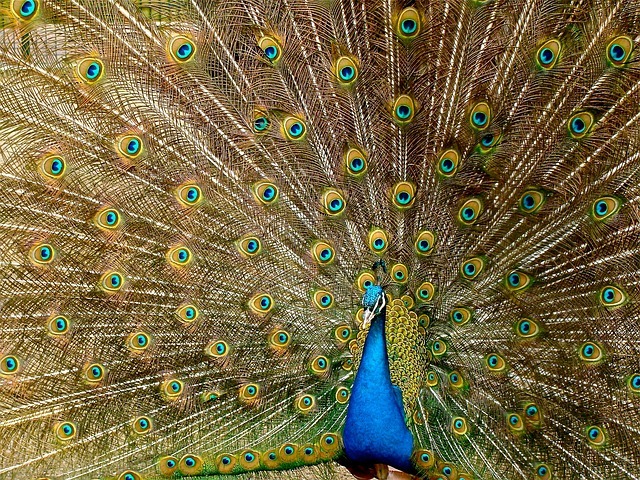 Like the code has passed one of those make-up stands in larger malls where your face gets painted in the colours of the Peacock. All those colours makes words stick out left, right and center. Conversely, I do love my own colouring scheme. I have spent some time tuning my colouring scheme and I like it. It's when having to do code reviews on other peoples screens that I at times have to squint my eyes and point with a finger when reading. Or when having to see large code chunks in a diff-tool for that matter. Black vs. white background. 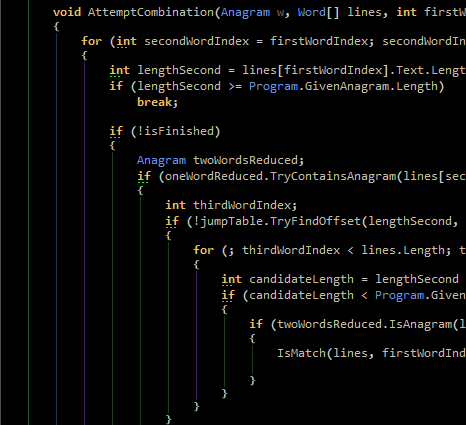 I've come to the conclusion that black is easier on the eyes on longer streaks of coding. Admittedly, and oddly, the black theme does take a little getting used to. 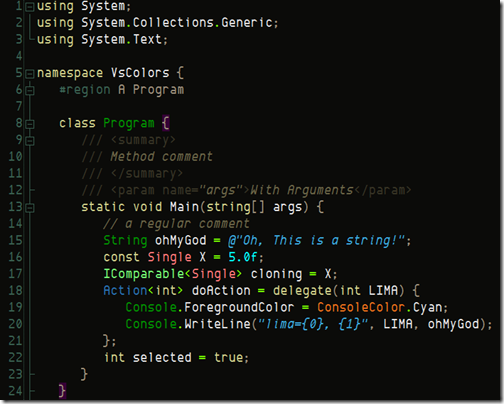 Comments in a dimmer colour to make the code stand out. 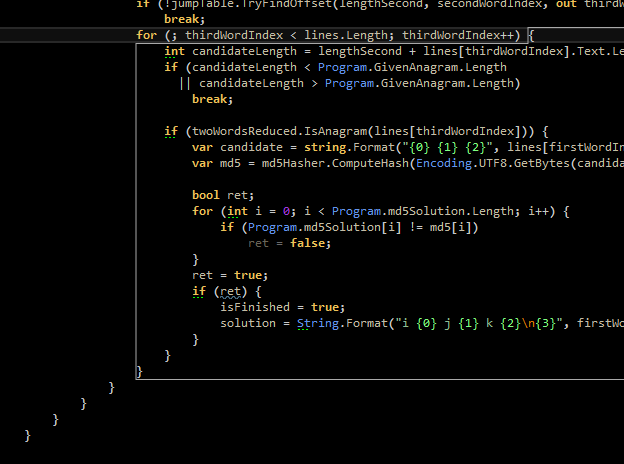 Highlighting the current line, and matching parenthesis/scopes in "aggressive" colours help. Colouring operator overloads is a good idea, it's nice to get warned that e.g. == in the code may have an entirely different meaning. Different colours for different operators such as +, -, * is a bad idea, but that operators in a different colour than number and variables help make them stand out. Tools such as ReSharper offer a lot of colouring tuning. I've found that you can tweak all you want, but in the end, with too many different colours on the screen it gets too funky to look at, and you can't remember the semantics behind the colouring any ways. E.g. reference types can be coloured differently that structs, inheriting an interface can be coloured differently than inheriting from a class. By now a common theme has emerged. We have seen examples of features that help in situations where code is gnarly: Long, and perhaps deeply nested. Of course we should embrace these new features and reap their benefits when we can. But it wouldn't hurt to stop and reflect for a moment that despite all these shiny fancy new features, we may be better of if we change our code such that it is more readable and manageable in an environment where such features are not present. to address than tools, techniques, and process.